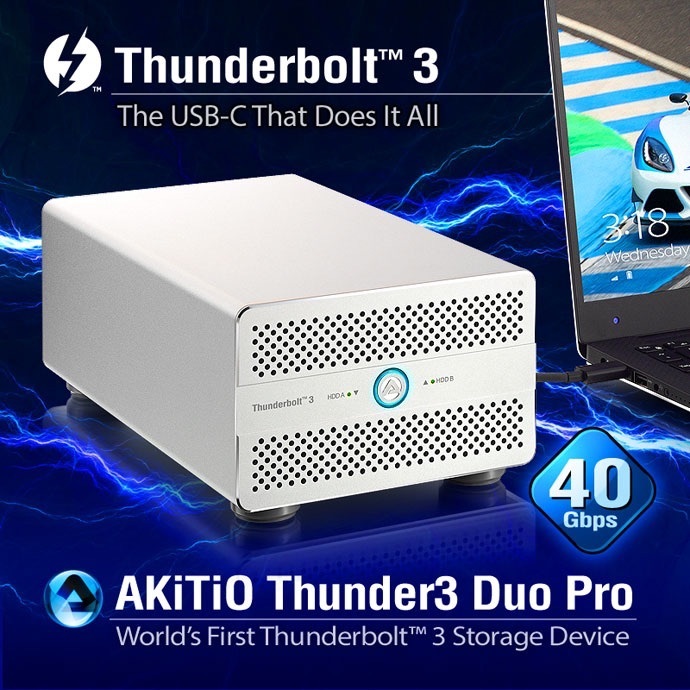 AKiTiO、デイジーチェーン接続も可能なThunderbolt 3対応のRAIDストレージケース 「Thunder3 Duo Pro」を発表。 | AAPL Ch. Thunder3 Duo Pro is offered as a 2-bay RAID enclosure supporting four RAID modes (RAID 0 striping, RAID 1 mirroring, SPAN, and Non-RAID). Thunder3 Duo Pro features two Thunderbolt 3 Ports, a USB 3.1 Gen 1 (Type-B) port, and a DisplayPort video output to connect the latest 4K 60HZ displays. The second Thunderbolt 3 port on the Thunder3 Duo Pro operates the same as a Thunderbolt 3 computer port by supporting Thunderbolt 3 (up to 5 daisy chained), USB 3.1 (10Gb/s), and DisplayPort devices. For added convenience, Thunder3 Duo Pro can accommodate 2.5” SSD/HDD and 3.5”HDD drives.